Built as a tug-icebreaker and anchor handling vessel under yard no 282 by Havyard Leirvik A/S at Leirvik, Norway for Transviking A/S, Norway. 01 October 1998 building contract signed. 02 February 1999 keel laid down. 20 November 1999 launched as TOR VIKING, two sisters. Tonnage 3.383 grt, 1,273 nrt, 2,600 dwt, dim. 83.7 x 18.04 x 8.52m, length bpp. 75.2m, draught 7.24m. Powered diesel electric by 2 MaK 6M32 engines, each 3,916 hp, and 2 MaK 8M32 engines each 5,221 hp, total power 18,274 hp, two controllable pitch propellers, speed 16 knots. One bow and stern thruster each 1,200 hp. 01 January 2003 owned by Transviking Icebreaking & Offshore A/S, Sweden, homeport Mandal. Renamed in TOR VIKING II. 03 December 2010 she towed the bulkcarrier GOLDEN SEAS with a cargo of Canola seed which was disabled in the Bering Sea underway from Vancouver, Canada to the United Arab Emirates, to Dutch Harbour during bad weather and high seas. 01 June 2017 again under Norway flag and registry. Renamed TOR VIKING. TOR VIKING is an icebreaker and anchor handling tug owned and operated by Norwegian company Trans Viking, but registered in Sweden. She has two sister ships, BALDER VIKING and VIDAR VIKING She has been employed supplying offshore Arctic petroleum drilling expedition. In late January 2010 the Swedish Maritime Administration called for VIDAR VIKING and TOR VIKING to serve as icebreakers in the Baltic Sea. The vessels are chartered on a contingency bases; Trans Viking's parent company, Transatlantic, is paid a basic flat fee for the vessels to be available, within ten days, without regard to whether they are used. They were used in 2007. The contract expired in 2015. 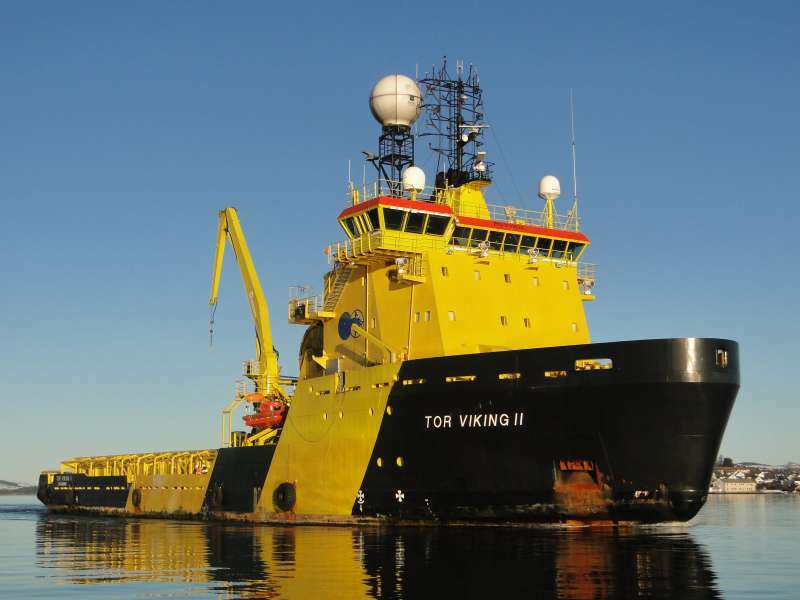 On 10 August 2018, Viking Supply Ships announced the sale of three icebreaking, anchor-handling tugs, TOR VIKING, BALDER VIKING and VIDAR VIKING to Canada. Once retrofitted the vessels will be issued to the Canadian Coast Guard. They are expected to be used for 15 to 25 years. 2019 Is given that she is in service and owned by Canadian Government Fisheries & Oceans, Ottawa, not renamed. 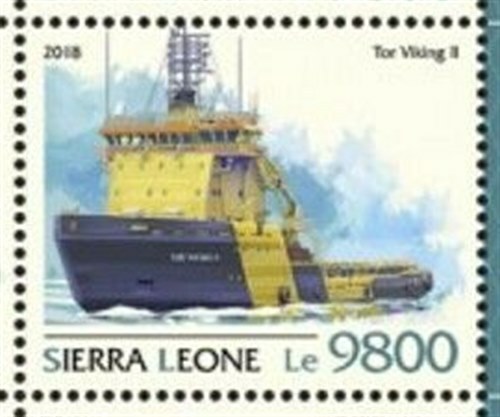 Sierra Leone 2018 Le 9800 sg?, scott?